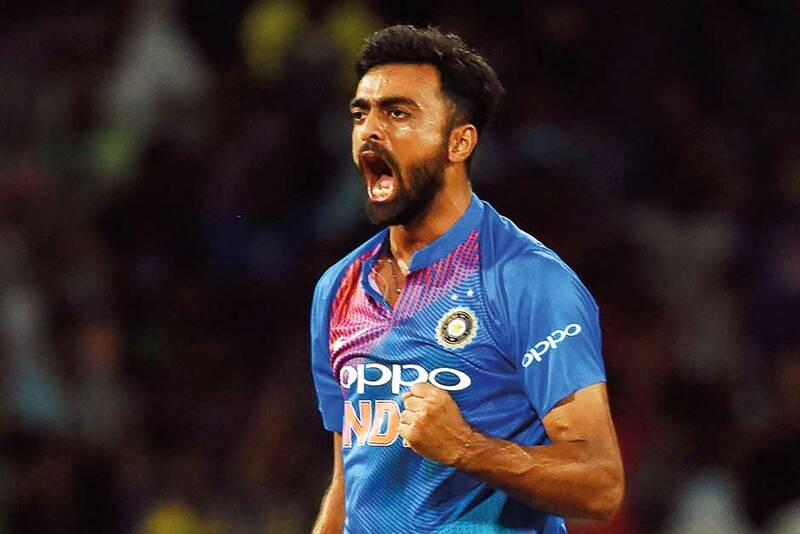 Colombo: He isn’t well known on the international stage, but fast bowler Jaydev Unadkat has been thrust into the cricketing limelight after being handed a bumper payday by the Indian Premier League. Heads turned when the Rajasthan Royals paid $1.8 million for the left-arm seamer, making him the most expensive Indian player at this year’s IPL auction. Even Unadkat said he was surprised at the price tag, which will earn him more than $100,000 per game when the competition starts next month. The 26-year-old was second only to England all-rounder Ben Stokes at the auction, despite a stop-start international career so far. Since his international debut in 2010, Unadkat has played one Test, seven ODIs and 10 Twenty20s for India, and had a mixed outing at last week’s tri-series in Sri Lanka. However, hopes are high that the “Prince of Porbandar” — nicknamed after his home city in Gujarat — could be about to become a fixture in India’s T20 team. “He is a very promising bowler and will only get better with the more matches he plays. I like him,” former India captain Sunil Gavaskar told AFP in Sri Lanka. Unadkat was just 19 when he made his one and, so far, only Test appearance against South Africa at Centurion in 2010. It was a debut to forget, however. He failed to take a wicket in 26 overs, gave away 101 runs, and was promptly dropped. Unadkat then spent three years in the international wilderness before playing all seven of his one-day international appearances so far in 2013. He missed much of the following two years through injury, and it wasn’t until June 2016 that he made his T20 debut for India. But his limited-overs international career received a shot in the arm late last year when he shone in a series against Sri Lanka. Unadkat finished with four wickets in three matches at an economy rate of 4.88, the lowest on either side. “He takes his cricket to the next level when he has to. He has got a few gears and I like now the change up in his action as well,” former Australian fast bowler Brett Lee told AFP in Colombo. “And that’s what you need to find in T20 cricket, it’s not all about running in and bowling flat out in T20. “You still need that skill set — yorkers, slow bouncers and that type of things,” added the cricketer-turned-commentator who was part of the same Kolkata Knight Riders squad as Unadkat in 2011. Unadkat picked up seven wickets in four games as India lifted the tri-series trophy in Sri Lanka after edging out Bangladesh in a thrilling final on Sunday. They came at a cost though, with Unadkat giving away close to 10 runs an over. But India’s stand-in captain Rohit Sharma insisted the bowler would be a key part of future Indian T20 teams. “He’s someone we can rely on going forward. He understands his bowling really well,” said the batsman. Breaking into India’s formidable Test side will be more difficult though, according to veteran sports journalist Ayaz Memon. “The fact that he is a left-arm bowler adds that variety to the Indian attack, because all the bowlers are right-arm. Also he is not a rookie and has experience,” Memon told AFP. Unadkat wasn’t the only unheralded Indian player to command a high price at the IPL auction: the Royals spent almost $1 million on uncapped off-spinner Krishnappa Gowtham, and Krunal Pandya went to Mumbai Indians for $1.38 million. “If we look at the history of IPL, teams which had a strong core group of Indian players have done well consistently,” former India opener Wasim Jaffer wrote in The Times of India.